What a gem of a place ... if you want to stop the world and step off for a while there is no better place to do this than Villa Aurora. A huge stone villa in a rustic location offering absolute tranquility, relaxation and quality family time. Well equipped with everything you could possibly need. Amazing views by day into the valley accompanied by the heady scent of jasmine and by night incredible starry lit sky from the roof terrace- perfect!. We stayed for ten days in April and had good weather - up to 29 degrees one day - though the wind was sometimes a bit chilly. In that time I lost count of the number of times I tried to capture the view from the villa across the valley and each time it just never lived up to the peaceful ever-changing vista we had in front of us. It was a fantastic relaxing break at Villa Aurora where the only interruption was the finches squabbling noisily in the bushes by the veranda. The house is great with every thing you need and a good BBQ out the back. If we had been there longer I would have tried the wood-fired Kleftico oven. A large American-style fridge keeps your salads beer and wine lovely and cold. I am determined to come back here and would recommend it without reservation. Just returned from our third visit to Villa Aurora. 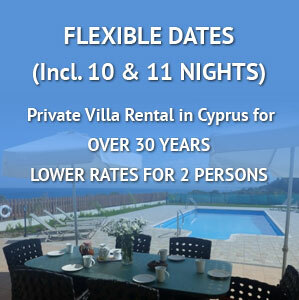 The villa has all the usual facilities but it is the peace and quite that makes it so special. We always manage to feel totally relaxed and refreshed when we return to the UK. Tavern Rodia in the village is a little gem and the owner is most welcoming and she will produce an excellent meze with just 24 hours notice. Well worth a visit. Already booked Villa Aurora for two visits in 2017. ... rural Cyprus unfolds in front of you. This is a villa you will remember! Lovely! Sunbathing in November is always a good thing! Taking in the panoramic views on the roof terrace as the sun rose with the first cuppa of the day - magic! Villa Aurora was absolutely amazing!!! I have to say it was thee best holiday my husband and I have been on in the 11 years we have been together! Hi Irene!!! So very sorry about not replying sooner! It was always my intention to email you as soon as we got home but unfortunately life has got in the way a bit!! Villa Aurora was absolutely amazing!!! I have to say it was thee best holiday my husband and I have been on in the 11 years we have been together! Words can barely describe it but I will do my best. As you may remember we travelled from Larnaca as we could get better flights. Although this was a bit of a pain after a 4ish hour flight it wasn’t the end of the world and it did mean we could get to the villa without loosing a whole day. When we finally found it and pulled up outside I was completely gobsmacked and sooo excited – I couldn’t believe this place was all ours for a whole week!! Mr Michael (who was lovely) greeted us and showed us round and discreetly left us to enjoy ourselves. We really appreciated the hamper as we didn’t know where anything was and being a Sunday could only assume not everywhere would be open. It meant we could cook a few fried egg sarnies, pop open the wine and beer and go for a swim!! Perfect!! The Villa itself was more than we could have expected – large immaculate rooms and bathrooms with plenty of storage, English sockets (bonus! ), massive beds and amazingly cool considering it was 40 degrees outside. The pool was perfect – chairs to lounge on, sun parasols to hide under (I’m a red head so have to be careful!) and best of all, lizards as friends!! We had 3 favourites that we named Boo (as he just kept popping up in the fence behind us), Brad (as he looked a little dopey in a surfer sort of way), and Splash as I had to rescue him from the pool – literally scoop him out by hand! I love lizards so I was mortified one might drown but relieved he was ok! We even had 3 house geckos who accompanied us when we had dinner!! Now the view! Wow!! I found my favourite spot to have my breakfast was on the top of the stone steps as you walk down to the pool. The morning breeze would whoosh thru gently while I sat in awe of the mountains and hills opposite! As a photographer at heart I could barely drag my eyes away and I took many, many photos (many of lizards!). So when we did drag ourselves away from the villa we went to the baths of Aphrodite, Lancia, and the supermarket in Polis and also had a few evenings there (Polis, not the supermarket) – Mr Mousaka’s was the best by far – Barry is still raving about his meal there and he is still laughing at my face after drinking a neat Ouzo!! But we soon found ourselves back at the villa watching the amazing sunsets on the veranda, drinking wine and beer!! We have never felt so relaxed – a perfect couples retreat from the stresses of the rat race - it was easy to forget the world outside!! We only saw people when we went out in the car! I could honestly say I could rave on about this amazing place all year – a true paradise! We would definitely come back! Everyone is soooo friendly, the weather was faultless and the whole experience one to remember forever! I can't thank you enough for showing us this Villa and I’m so pleased we dropped everything to go in 48 hrs! and to top it all off we got it for the same price as we went to Minorca in a Hotel the year before! Seems ridiculous now when we could have been in a Villa like Aurora!! I would love to book thru you again too as you made it like booking thru a friend! It's been lovely writing this feedback sat at work (don’t tell my boss!) while it's raining outside as it made me smile remembering the fabulous week we spent at Villa Aurora! I will follow this message with a few photos I took to help share our experience. (In case you want them for customer feedback on the web.) Please by all means can you keep us in the loop of any special couple’s rates you have on your villas as we would be very interested in them!! Thanks again for all your help, advice and support!! Suzi and Barry Dorr. Note from Irene. I always have couples rates, and extra special rates on certain villas, just ask. This is the third Villa we have booked with you and it just gets better. Dear Lauren, We found Villa Aurora delightful in virtually every way. We didn't want to put the immersion heater on - I think we used it twice, once by accident once by design - so we adjusted showering and shaving to the afternoon when we had plenty of hot water. That said, we have nothing but praise:- Shangri La translated to Cyprus, under a different but most appropriate name as I found myself getting up early to watch each day's dawn, a wonderful sight. We were so absorbed by Aurora's attractions that we ended up making a fraction of the excursions that we had in mind! Having said that we will almost certainly visit Kykkos and the Troodos mountains next year and are entertaining the notion of that long day excursion to Israel. Any details would be appreciated. You will know that we have expressed the wish to book Aurora next year for the four plus weeks... I cannot end this ever lengthening review without expressing how much we appreciated the warmth and hospitality of Michalis, Stefanos and Chrysoulla, and, indeed, the warm generosity of spirit that seems to infect the island. On one occasion we gave a fellow customer at a local supermarket so much amusement that he dived into his van and presented us with a bunch of herbs. I quote this only as a particular illustration of a general trait. Delightful people everywhere and delightful experiences daily. And, of course, there is you and your representative, Nicole I think. Your organisation has been smooth and efficient without being officious, and most pleasingly personal. Do apologise to Nicole for my ill manners in not replying to her emails and thank her for her cool advice on the one occasion that we had need of it. If there is one request you might pass on, may I suggest an idiot's guide to the use of the DVD player and Wifi. The wifi we managed (with help) the DVD remained a mystery (despite help!) Yours most sincerely, Paul D P.S. You cannot have other properties as attractive as Aurora, can you? I ask merely out of curiosity just in case a time should arise when Aurora is not available. PPS. The ring is Jackie's. She says she will collect it when we return next year! Villa Aurora has all the little finishing touches that make it feel more like a home than a 'holiday rental' . Stunning views and fresh air - what more could one ask !!. Aurora is completely private, with no traffic or intruding eyes - ideal for an all over tan!!! Dear Irene, Bet and I would like to thank you for arranging our wonderful holiday in Cyprus - this for the 3rd time in as many years. The Villa and location gets better every year. After staying in Paphos and its surrounding area for our first holidays in Cyprus. 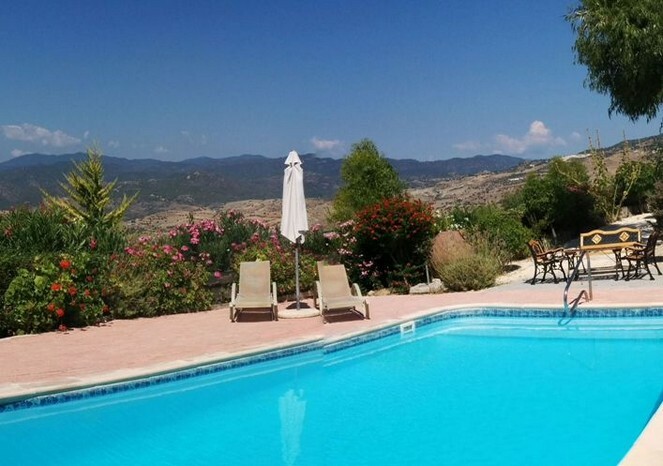 This year we fancied moving to another area and with your help, we selected the outstanding and beautiful valley in Simou - which is roughly halfway between Paphos and Polis. The location of "Villa Aurora" is fantastically placed, with the Paphos forest as a back drop, looking down on Polis and the Mediterranean sea. Aurora is completely private, with no traffic or intruding eyes - ideal for an all over tan!!! which was high on my list. The proximity of Simou village to Paphos, Polis and Latchi is ideal - giving us a choice of beaches - which we visited on a daily basis - to bathe in the warm Mediterranean water. We made many friends with the local people - especially when eating out at the many local Tavernas - while the modern supermarkets in Polis provided us with all our needs during our two week stay. Bet and I found it very difficult to pack our cases to return home and have decided that when we again return to Cyprus, we will definitely be returning to Villa Aurora. We have no hesitation in recommending Simou as the perfect location for a perfect holiday. I thank you for your generous birthday present for my 70th birthday on the 10th September. Yours with many thanks, Wil and Bet Moore. PS. After arriving home on the Isle of Anglesey on 16th Sept., we've had rain on a daily basis and a temperature of lower than 60 degrees, compared with 92 degrees and constant sun in Cyprus. Welcome to Wales! I could not think of anything that Sundance could improve on. Villa Aurora was not as you described, it was better!